Have you ever wanted to attend a rubber stamp and scrapbooking show?? 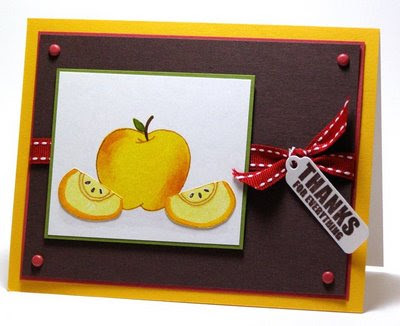 Although here is a Starving Artistamps card to get you in the mood. I had lots of fun with Copic and shimmery type products- Brilliance Moonlight inkpad, pearl ex, Spica pens, and satin ribbon. Stamps from here! I hosted a challenge for the DTGD over at SCS, but I forgot to post my samples. I actually did two. I never bothered posting the first one. I like it, but it's kind of somber and it was not the easiest thing to photograph. 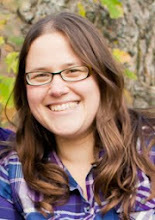 So here it is, blog exclusive, well until I upload it over there. 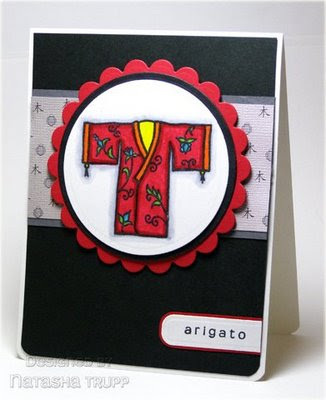 Also, this was a card where I really, REALLY, wanted to use black velvet ribbon. However, it seemed that I do not have any, I really thought I did. 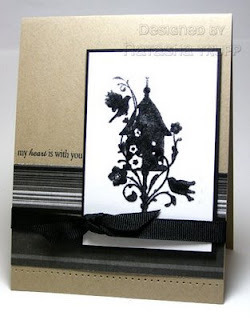 Anyway, the main image was stamped with a glue pad, then I quickly applied some black flock. The patterned paper is from a pack I got at Costco about a year ago. The phrase comes from Verve. It's funny, I meant to spend the whole weekend stamping up a storm. Other plans came up and Sunday evening rolled around and I had nearly nothing to show for it! Well, then we decided to watch Harry Potter: Order of the Phoenix. It's one of those movies, since I read the book and they really don't deviate much from the storyline, you can really focus on doing something else. All of a sudden, by the end of the movie, I had 5 cards that I was quite pleased with completed!! I think one of things that helped the most is I limited myself to very specific supplies, since I temporarily relocated upstairs. 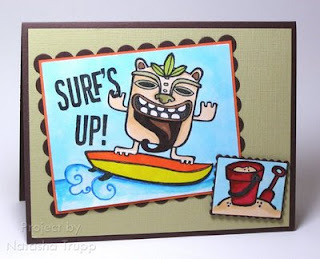 One of the stamps I brought with me was this delightful Surfboard Trio stamp by DeNami Designs. That's all for now! 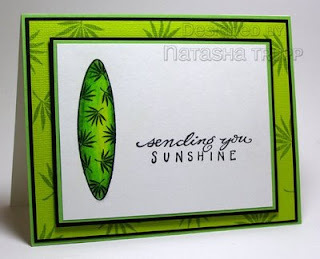 Hope your day was full of sunshine! 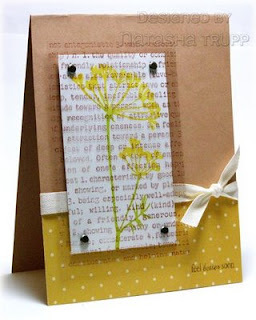 So this card started out as being inspired by the ribbon (for Jody's challenge). It was pretty, pink and brown, and striped. Those colours had me thinking of cupcakes which fit nicely with Taylor's challenge. And then I thought, why not throw Holly's sketch in there, it brought things together nicely. I know there's SO much cupcake stuff out there right now, but I still haven't found what I deem the "perfect cupcake". Since I don't have cupcake stamps that I <3, I sketched out a few and went from there. It is by no means the "perfect cupcake", but it'll do. The Dare to Get Dirty week is half way through, but there's still plenty of time to join in the challenges! Here are few cards I have made for some of the challenges. 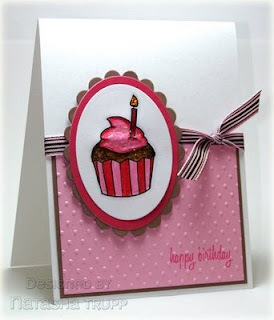 This first card was made for Julie's challenge. The challenge was to make a clean and simple white based card. I really like making this type of card. It truly is a challenge, adding the exact right amount of images and embellishments. I used a long rectangle nestability to emboss/deboss (depends how you're looking at it!). I masked that and stamped my images and saying within the rectangle. This next card was made for Sharon's challenge. It was a similar concept: Stamp Simply. by this she means keeping it clean and pretty, but adding that little extra something that brings about an elegant quality. 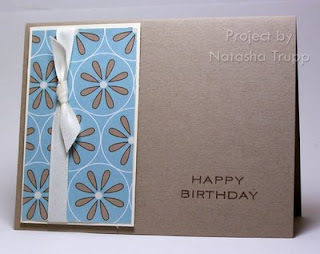 For this card, I started out with vellum. Vellum always makes me think of elegance. 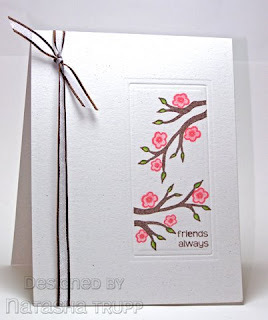 I stamped that with a damask image in white ink. 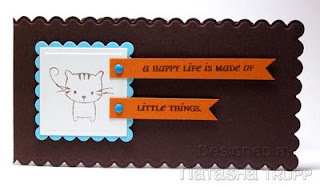 I let that dry a bit, then flipped it over and attached it to a chocolate card base using chocolate coloured brads. 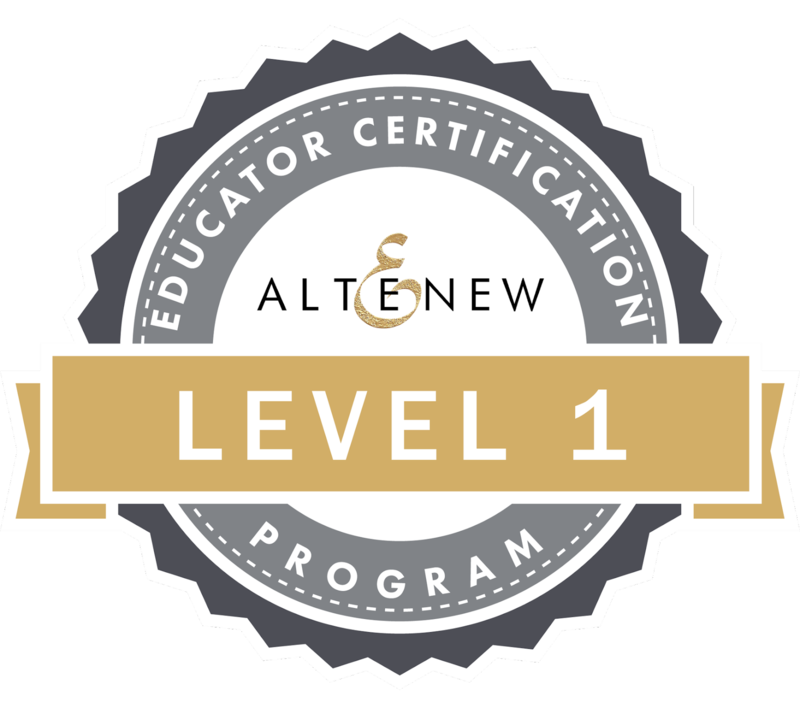 I finished it off with some luscious chocolate satin ribbon and a sentiment that was a bit on the script-font side. I will be working on more of the challenges tomorrow (3 day weekend for me! ), so stay tuned. 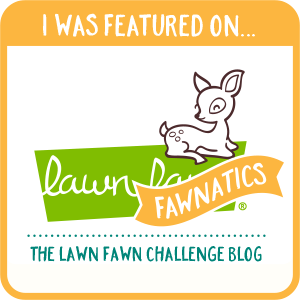 In the mean time, the Dare to Get Dirty challenges can be found HERE for the forum. Check HERE for the gallery. AND... there are still a few more hours in this week's round of gallery idol (it ends noon at mountain time today). If you would like to support me, check out here and go to the link under Description, and vote for Tashers. So, my card made it through the first round at the PaperCrafts Gallery Idol. The theme for the next round was Monochromatic. I went with a truly "stampy" card. I know it's popular to make scrappy cards, especially for magazine publications, but that just wasn't being true to my style. If you would like to support me, check out here and go to the link under Description, and vote for Tashers. In other news, the Dare to Get Dirty challenges start this week! So I might as well post a card. 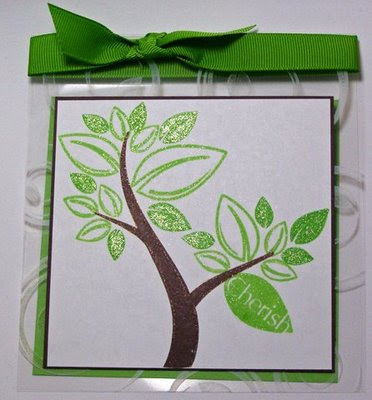 This card features another new gel-a-tins set. 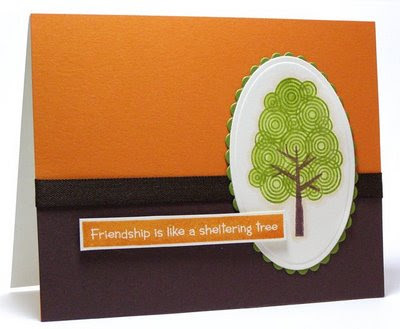 This one is called Sheltering Tree and it's a fabulously fun build a tree set. For the tree, I stamped the top part with regular dye ink, then went over with an aquapainter to shade it all in. I have to say, when I first saw this set. I thought WOW, what a neat set for scrapbooking. I was a little stumped as far as what I should do a card. But then, inspiration hit! I thought, hey, wouldn't the tree trunk look nice as a limb. I was thrilled with how it turned out. I had stamped all the leaves on the white layer, but I wanted a bit more WOW, so I stamped them all on white and cut them out. 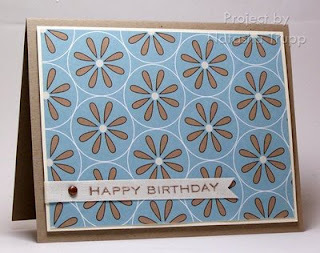 For card number two, I was thinking about how cool the swirly bits in this set would look as a background on white. So that's what I started out with. Then I went ahead and used the tree trunk as a trunk, adding in some nice green leaves. Next I went over all the leaves with a green Spica marker. For this first one, I wanted to show how versatile these apples were. I wanted to make them look a little more lifelike. I sponged my inks and outlined the apples and I have to say, I was thrilled with the results!! For this one, I wanted to make use of the adorable shaped sentiment. I went with a good old stand by layout, but jazzed up the background with embossed circles. I had JUST purchased the Memento Ink Pear Tart. 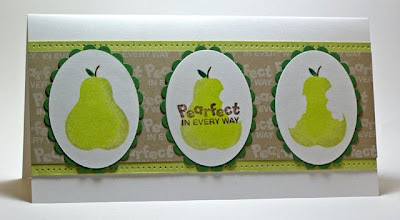 It only seemed appropriate to use it with this pear image. For the bite marks, I stamped the pear on a post-it, then drew over where I wanted the image to be taken away from. I used those to carefully mask. Other news: I made it to the Top 15 in the Gallery Idol contest!! Thanks to all who voted! I will also be sharing more fun gelly releases throughout the week. These ones are set to be available by July 25th! Here's a quick and fun clear card for you. One thing I LOVE about making the square clear card is using this layout. 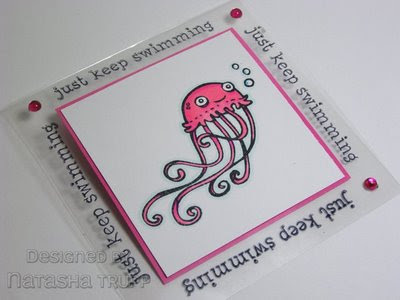 All you need is a fun image that will fit nicely into a 3x3 square and a sentiment that is also about 3 inches in length. Find the perfect coordinating embellishment and you're set! I am still quite enjoying this Sushi set by a muse. So much fun! For this card I really wanted a band of something behind the main image. Finally I found this piece of paper from the DCWV Far East mat stack. Remember, you can still vote in the PaperCrafts gallery idol contest. My card is here. To vote for any card, go to the link under Description. It will take you to ballot. Hello! The PC Gallery Idol cards are all posted now. If you want to view them all check this out. Mine can be found here! To vote, be sure to follow the links under the description, where it says Click Here to Vote for your favorite! . It is not the "love it" button. This is a card I made quite a while back. I was in the mood for a wordy transparency overlay, so I made one! I really like how the brads worked as an attachment device and a decoration. I've seriously been wanting this set for months. I even held it briefly in my hands at the Winter CHA. Finally, I have it all for my own! 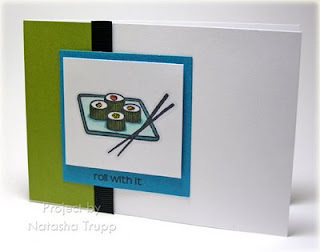 I love sushi, I love stamps, it's really strange that I didn't pick up this set sooner! I've been away from my craft stash since Wednesday and I am feeling pretty exhausted, so it's just a quaint and simple type of card tonight. In keeping with an Amuse tradition, I made my card base 3.5x5. It really is a nice size when you are wanting something quick, but with a bit more room than the 3x3 square note card. I stamped the sushi with Memento Tuxedo Black. These inks are quite awesome! I coloured with some Copics. And to finish off the fish roe, I added various stickles. Seriously, all these amazing Amuseapalooza samples I've been seeing have been taking their toll on me (in a good way). I was always afraid to try the cute little banner, pendant, sparrow tail (there's many names for it) sentiment tag. But now, it's my latest obsession. Especially after seeing Scoopy's easy method of making these! This is card is WAY cuter in person! I already a 6x3 card cut out. But then I thought, how cute would it be to make the entire thing scalloped. So I used a the largest scalloped rectangle Megability. Love the result! For this card, I was wanted to show how the DoodleFactory Tropics set can be used for not just ultra cute character type cards. There are a lot of other beach images in the set that can stand on their own quite nicely. This large palm tree is one of those. I ran my orange paper through the cuttlebug with a texture plate to give it a cooler look. 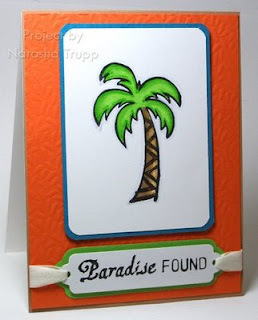 The palm was coloured in with pencil crayons, and the sentiment was cut out using a Nestabilities tag die. 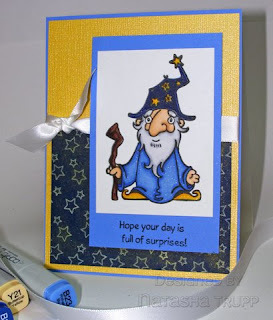 Sometimes cardmaking seems a bit TOO fun. I had a good time creating this card. At first I thought the scallops might not work with a summery, masculine type theme. But, you know what, I really like the postcard vibe they brought to the card. Just a few quick cards today. Whenever I get 12 x 12 paper, I cut it up into 6x6 squares. This has really encouraged me to use what I have. Anyway, I LOVE this Granny's Kitchen paper by SEI, and really wanted to make some Kraft based cards with the paper as an accent. So I grabbed one 6x6 square and got to work. I used the same stamps and ribbon on each card. 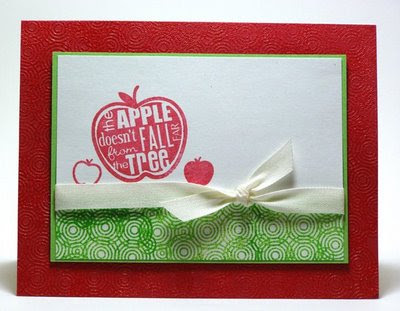 On the first card, I really wanted to try stamping on some twill. I also wanted to try the sentiment flag style. I was quite pleased with this look. I see it a lot but I've never tried to pull it off. The brad on there is strictly decoration. I used tape to secure the flag, so it's not like the brad serves any practical purpose. 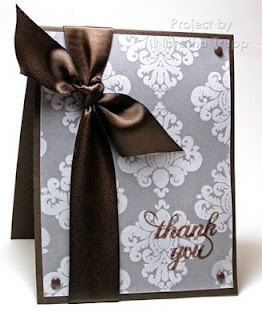 For the other card, I went with the same orientation, but used the ribbon as exactly that. I switched up the was the sentiment was stamped. I still have 2 decent sized scraps from my 6x6 square, so I need to do something with those as well! Thanks for stopping by today! 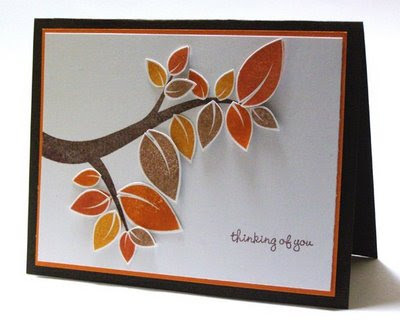 My exciting news for the week was that my card was chosen as one of the Top 20 finalists in PaperCrafts gallery idol. Mine is second from the bottom here. Be sure top check out the site on Monday for the challenge cards! For my card yesterday, I thought I'd show how I used the nestabilities to make the scalloped and rounded edges on the card. I'm sure there's a tutorial somewhere on the internet. I briefly looked, but didn't find one. 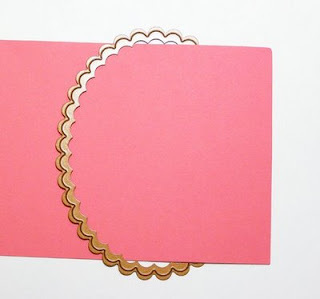 Basically, you just feed your cardstock through the template so that only one side is in contact with the cutting side. Then just run it on through your die cut machine as usual. That's all there is to it.